The SUN StorageTek 2500 Series offers entry level SAN connectivity for heterogeneous operating environments including Windows, Linux, and Solaris. The StorageTek 2500 series is easily integrated into existing SUN storage environments due to the shared "Common Array Manager" (CAM) software utilized by the StorageTek 6000 and J series arrays. Up to (36) 2TB SATA disk modules or (36) High Speed 600GB 15K SAS disk modules can be attached to the 2500 series RAID controller. The base controller offers (12) 3.5" LFF expansion slots. Up to (2) SUN 2501 expansion trays can be attached which also house (12) drives each. - The SUN StorageTek 2510 offers up to (4) 1Gb iSCSI ports for host connectivity. - The SUN StorageTek 2530 offers up to (4) 3Gbps SAS ports for host connectivity. - The SUN StorageTek 2540 offers up to (4) 4Gbps FC ports for host connectivity. 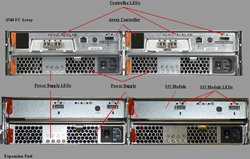 In 2011, SUN / Oracle releases the 2500-M2 generation of arrays. iSCSI was dropped as a host connectivity option while 6Gbps SAS and 8Gbps FC replaced their 3Gbps and 4Gbps counterparts. Up to 96 disk drives can be attached to the 2500-M2. Contact iStorage Networks for technical configuration or ordering assistance.